Buy 2 Riedel Red Wine Glasses and Get 2 Red Wine Tumblers Free! EXCLUSIVE to Wine Enthusiast. Buy 2 Riedel Red Wine Glasses and get 2 Red Wine Tumblers Free. BEST ANSWER: The Riedel Red Wine Gift Set (Pay 2 Get 4) comprise of 2 Vinum Cabernet/Merlot/Bordeaux Wine Glasses which have an overall height of 8 7/8 inches high, with the bowl being 5 3/8 inches high, and the mouth diameter at 3 inches wide. The base is 3 7/8 inches in diameter and the glass holds 21 1/2 oz. 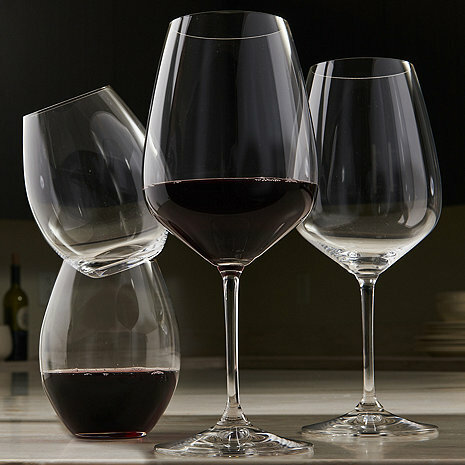 There is also a set of 2 Riedel 'O' Stemless Wine Glass Cabernet which are 4 7/8 inches high, with a mouth diameter of 2 13/16 inches and a capacity of 21 1/8 oz. These look like the riddle heart to heart glasses. Do you happen to know if they are it? BEST ANSWER: I don’t think so, these are very nice Riedel glasses which I have been buying for many years! Yes they are the Riedel brand. BEST ANSWER: The Riedel Red Wine Gift Set (Pay 2 Get 4) are lead free. First, let me say that the glasses arrived in perfect condition. I used the stemmed glasses last night and was very pleased. Unfortunately, the answer from a WE staff member in the Questions says that the tumblers in the pack are Cabernet tumblers and I received Syrah tumblers. I was very disappointed because I wanted these glasses specifically for Cabernet, my wine of choice. I can't remember the last time I purchased any Syrah.